The psychrometric measuring technique helps to determine relative humidity directly. The psychrometer consists of two independent thermometers, one is dry and one is wet (called dry-bulb and wet-bulb). The wet-bulb is surrounded by an absorbent fabric, which is kept soaked in water. 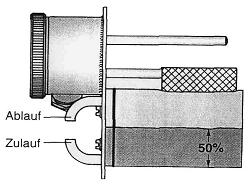 An air stream is circulated along the bulb (ventilator, sling psychrometer). This is important in order to release a certain amount of water vapor, through evaporation onto the bulbs. Hereby, the surface of the wet-bulb cools noticably (wet-bulb temperature). 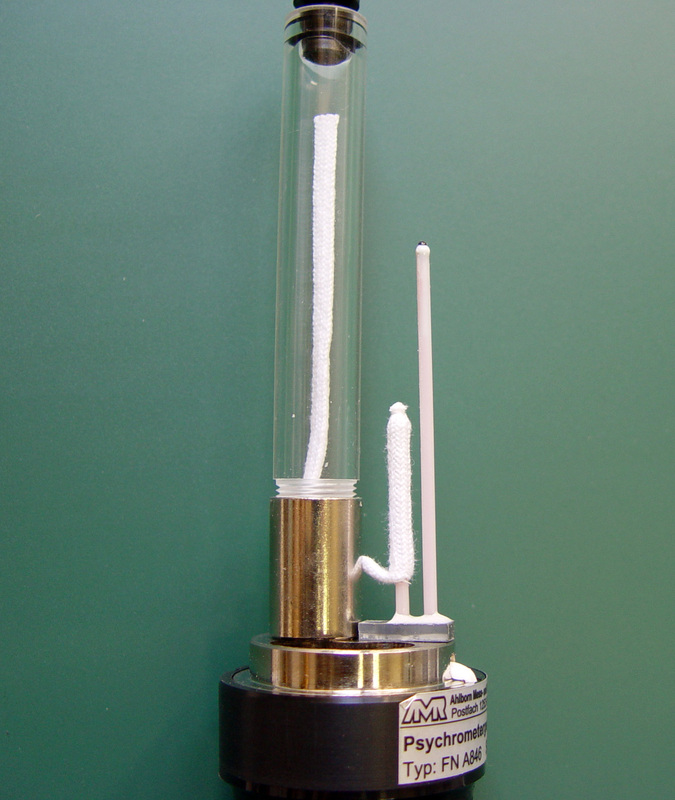 Simultaneously, the ambient air temperature is measured with the dry-bulb (dry-bulb temperature). The determined psychrometric temperature difference is a measure for the relative humidity in the air. When handled with due care, the psychrometer can deliver a precise determination of the relative humidity. For instance, the aspiration-psychrometers according to Assmann are internationally recognized reference and control devices. An integrated fan with spring winding, provides an average constant air velocity of approx. 3m/s, which flows around the bulbs. The temperature difference is read from to calibrated glass thermometers. The evaluation is carried out manually, using a table or graphic psychrometer chart. The aspiration psychrometer charts of the German Weather Service may be used for greater accuracy of the analysis, they also divide into 10ths of degrees. Psychrometers, other than hair hygrometers, detect the relative humidity directly, therefore do not need calibrating. The values may be adopted with an uncertainty of 1-1.5% RH. It takes 2-10 minutes until a true value can be read, depending on the relative humidity. The psychrometric method is dependent on air pressure and it should actually be included in the measurement. In practice, however, it is usually omitted because a fluctuation of 20 mbar only results in an error of less than 1% RH. The psychrometer is easy to use and gives reliable readings when handled appropriately. It is an important device for controlling the ambient air condition. Apart from the aspiration psychrometer, a wide variety of different designs are available. For most mechanical psychrometers with glass thermometers, the field of application is limited to a climate range of temperatures up to 60°C. The advantage of the design is that there is no need for mains electricity. The electric psychrometers can be used for a wider variety of tasks. Here, the wet-bulb and dry-bulb temperatures are measured with a Pt 100 resistance thermometer. The relative humidity is determined using the "Sprung formula". The information is processed by a microprocessor and can be seen directly on a display or is processed further. The temperature ranges from nearly 0 up to 100°C. This robustly built psychrometric measuring method allows for measuring the humidity in polluted and soiled places or in the presence of solvent containing or corrosive gases.